Looking for Meeting rooms in Milan ? Easily reachable with any public or private means of transport. The ideal solution for many necessities! A meeting room in Milan has to be easily reachable with any public or private means of transport. A meeting room in Milan must be placed in an area that allows you to match your meeting to a lunch, a dinner, an overnight stay. A meeting room in Milan must always make its guests feel at ease, through a fashionable and welcoming furnishing. A meeting room in Milan must be properly equipped with the most advanced technologies in order to allow the maximum flexible and multifunctional use of the appointment. It sometimes happens to go to an appointment with two, three or more people hosted in a restaurant, in the hall of a hotel, or even worse, in the snack bar of a railway station or of an airport, places unlikely to use asmeeting rooms. These are situations when intolerability raises fast, your guests look forward to the end of the meeting, so they could return to their offices with real meeting rooms and the comfort of a desk, in a space provided with suitable equipments to perform their activities. It may also happen to have to make a recruitment with more candidates at once, to have to organize an updating course, an informative course or simply the presentation of a product or of your own company. 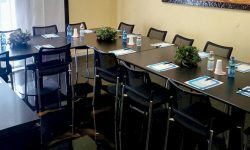 You often turn to a hotel that offers its equipped meeting rooms and fitted conference rooms. As impressive as the meeting room you choose may be, you will hardly prevent the participants from thinking, during or better yet at the end of the meeting, maybe in the comfort of their office or meeting room, at the image of insecurity transmitted, at the famous “they don’t have their own office, today they are here, tomorrow who knows!”. In order to avoid this type of fall of style, the perfect solution, in case you need a meeting room in Milan, is to refer to our business center to rent a meeting room in Milan, elegantly furnished and operational, equipped with the most modern technologies and accompanied by a reception service and multilingual secretariat that will accommodate your guests comfortably as if they were in their office.